Welcome to the Westgate Lofts. 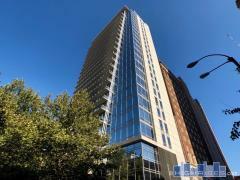 Beautiful 2 BR 1 BA loft with assigned parking space in garage. This cool floor plan offers so many options for furnishing to your desire. With a private balcony off of the living room it's the perfect space. Enjoy cooking on the grill then eating in your living room/entertaining space. The rustic look complete with exposed brick and air ducts makes for quite the experience. The two bedrooms can be used however you like. The staging of this unit utilizes the larger bedroom as the master and the smaller as an office. The in unit washer/dryer is conveniently located near the bath and tucked away for your convenience. The wood flooring coupled with exposed brick bring a true charm that never gets old. The building has the perfect splash pool on the rooftop adjacent to the community room for those special summer time parties. Schedule your appointment today. Easy to show.